Please welcome today's paranormal guest author Kimber Leigh Wheaton. 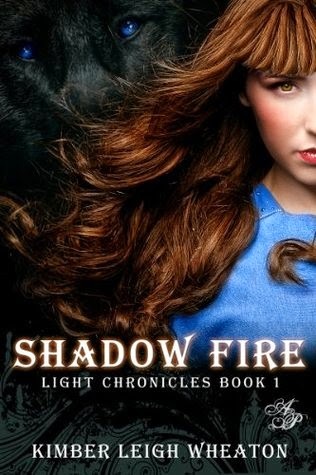 Today we have a special book excerpt from SHADOW FIRE by Kimber Leigh Wheaton and a fun Q+A with the author. We are also hosting a fabulous giveaway. Keep on reading to enter! Kimber Leigh: I've always enjoyed writing—used to write all sorts of short stories in high school and college. A couple years ago, my son reached an age where he was more independent. Suddenly I had this free time, and for a while I didn't know what to do with it. The idea for Shadow Fire hit me out of the blue one day. It grabbed ahold, and I was a woman possessed. One month later I had my first draft. There was no planning, no outline. Ashlyn, Zane, and Taranis were in my mind, and their story needed to be told. I loved writing Shadow Fire and Stolen Moon soon followed. Writing has become a passion. Life would be dull without it. Kimber Leigh: I've had an interest in the paranormal since I was a child. I love all sorts of mythology and folktales. My bookshelves are filled with books on the paranormal that I've collected through the years. I have a novel, Tortured Souls - The Orion Circle Book 1, coming in July about a group of teenage paranormal investigators. In that series I plan to really explore the supernatural world: ghosts, cryptozoology, werewolves, vampires—you name it. I just find the whole supernatural world fascinating. Kimber Leigh: Shadow Fire is a lighthearted, fun adventure with a touch of whimsy and a sweet romance. It definitely takes its cue from the RPG video games that inspired it. It's the first novel in a series of standalone fantasy romances. No cliffhanger endings here! Written for readers who like their characters silly at times and their 'ever-afters' happy. Kimber Leigh: This is a rather difficult question for me to answer. I always pictured Shadow Fire as an animated movie. I also tend to see my characters more as anime than real people. I think Princess Anna from Disney's Frozen would be a great in Ashlyn's role—no question. Princess Anna not only looks a bit like Ashlyn, but she's loyal, determined, and sweet. For Zane, I'd have to choose Kratos Aurion from Namco's video game Tales of Symphonia. Kratos is lacking Zane's sense of humor and ethics, but I think he could pull off the role quite well. They're both amazing swordsmen, and Zane shares some of Kratos' wisdom as well as his more serious nature. Taranis is really hard to cast… slap a red wig on Miroku from InuYasha and he might do a good job as Taranis. Miroku is quite similar to Taranis in many ways. They're both guys who are a bit too fond of the ladies which tends to get them in trouble… but they're also loyal, courageous, and fun-loving. The elders told me being Chosen is an honor. Either they are ignorant or apathetic. Every five years for the last twenty, a teenage girl has been chosen by the town, via secret ballot, to undertake this dangerous quest, never to return. Perhaps if the elders had to forfeit their lives instead they wouldn't be so quick to label it an honor, they'd call it what it is…a sacrifice. To enter, use this Rafflecopter form. This is a tour giveaway. Open only to those who can legally enter, receive and use an Amazon.com Gift Code or Paypal Cash. Winning Entry will be verified prior to prize being awarded. No purchase necessary. You must be 18 or older to enter or have your parent enter for you. The winner will be chosen by rafflecopter and announced here as well as emailed and will have 48 hours to respond or a new winner will be chosen. This giveaway is in no way associated with Facebook, Twitter, Rafflecopter or any other entity unless otherwise specified. The number of eligible entries received determines the odds of winning. Giveaway was organized by Kathy from I Am A Reader, Not A Writer and sponsored by the author. VOID WHERE PROHIBITED BY LAW. Giveaway ends May 25, 2014.
enjoyed reading the Excerpt and Q&A :) Thank you for sharing.